Senior Hamas official says rocket attack this week aimed to sabotage Egyptian ceasefire efforts. The Hamas terrorist group on Thursday pledged to launch an investigation into Wednesday’s rocket attack on Israel in which a rocket directly hit a home in Be’er Sheva and a second rocket fell off the coast of Gush Dan. The family members in the Be’er Sheva home, who suffered from anxiety, were saved a few moments after the mother rushed her children with her into a bomb shelter. 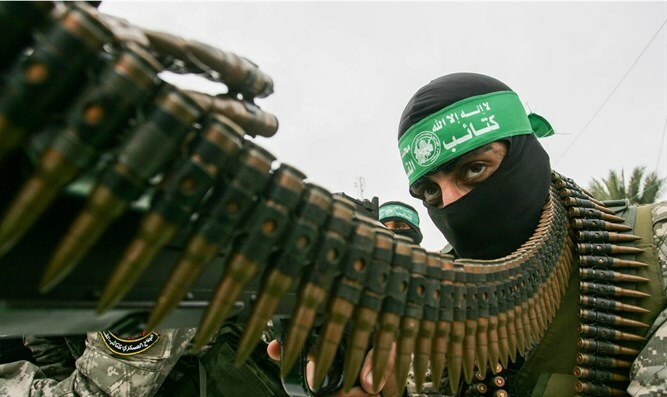 Hamas issued a joint statement with the Islamic Jihad terrorist group publicly disavowing the rocket fire, but Israel rejected their denial, saying they were the only groups armed with rockets of a range sufficient to reach Be’er Sheva and the sea off Tel Aviv. Speaking to AFP, senior Hamas official Bassem Naim said "there are security service investigations in Gaza to uncover who is behind the rocket fire and there will be harsh measures against those (found guilty),"
He said the rocket fire "aimed to sabotage Egyptian efforts" to broker a long-term truce between Hamas and Israel. Despite Hamas’ denials that it was behind the latest rocket fire, its so-called “military wing” on Thursday released a new video threatening Israel. In the short 26-second clip published by the Izz al-Din al-Qassam Brigades, Hamas terrorists can be seen readying missiles for launch amid ominous music in the background. The video warns Israel in both Hebrew and Arabic that "we recommend that you read us correctly- mistakes will not make things better". Meanwhile, Israel's political establishment, in light of the assessment in the defense establishment, has admitted that it is possible that the rockets fired at the city of Be'er Sheva were caused by a lightning strike. The editor of the El Maseer website, Shimrit Meir, exposed this assessment and even received approval from military sources to reveal that although this the odds of this occurring is very low, it is not beyond the realm of possibility.